His upbringing in a multilingual household in Kashmir and Delhi—he was taught to speak in Urdu, Kashmiri, English with a looming presence of Arabic– and his later life in ‘exile’ shaped the central themes in his work such as multilingual, multicultural richness, borders and migration, diaspora and most importantly, the blessing and curse of memory. Much of his poetry is written in his time away from his home, which he often recreates through his memories and words. A line in his poem, “Memory, no longer confused, now is a homeland” best describes the emotional crux of his poetry. 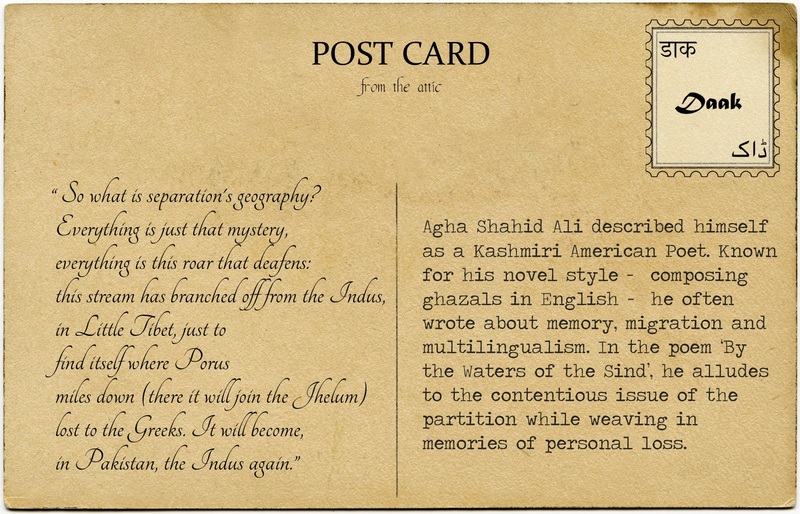 In the poem ‘By the Waters of the Sind’, he alludes to the contentious issue of the partition while weaving in his memories of personal loss. So what is separation’s geography? in Pakistan, the Indus again. In this paragraph, he captures how even though the land may be divided, a river tears through these artificial boundaries. Amidst imagined differences lies a shared history devoid of the nomenclature of difference. He questions the idea behind the separation before bringing in a story of a personal separation. “It is two months since you left us. So this is separation?” he writes, as if to come to terms with it. From which you have vanished? its light will leave me–where?